Joining the Council as an at-large member in 2019! Olivia received her Masters of Science in Botany at Oregon State University and is now a Riparian analyst with The Freshwater Trust. Olivia works at the intersection of applied ecology and restoration. This means she connects research and management for effective restoration practices. Invasive species are one of the primary threats to successful riparian restoration and the ecosystem services that she is trying to restore (i.e. water retention, water temperature, fish & wildlife habitat). Invasive species, particularly noxious weeds, continue to be a critical issue impacting restoration. Olivia wants to address this issue to protect Oregon’s resources for future generations. Outside of work, Olivia loves discovering new places to explore with her family. If it’s down a dirt road and along a river, she is there! Recently, Olivia was able to combine her adventures with a role as volunteer botanist out in the Eagle Cap Wilderness in the Wallowa Mountains. She combined efforts to both set up a new GLORIA site and spend time catching bugs with her kids. Picture of Olivia Duren exploring with family and doggo. As a new Council member, Olivia is most looking forward to learning from her fellow Council members and connecting efforts across Oregon, Idaho, and California. Oregon Invasive Species Council Welcomes 5 New Council Members for 2018! Each year, the Oregon Invasive Species Council (OISC) sends out a request for nominations to fill available appointed member seats. Council members are drawn from government agencies, tribes, universities, industries, organizations, and the public with an interest and expertise in some aspect of invasive species management. In December 2018, five new Council members were selected for an upcoming two year term (2019-2020). In addition to the new council members, Dr. Helmuth Rogg will serve as the Oregon Invasive Species Council Chair for 2019. Helmuth is the Director of Oregon Department of Agriculture’s (ODA) Plant Protection and Conservation Programs Area and has served on the Council as an ex-officio member since 2014. Norie is the director of K-12 Education Programs with Oregon Forest Resources Institute and has worked for more than 30 years with K-12 students and teachers in both classroom and field programs. She is well-known and respected throughout the state for working collaboratively to develop and support relevant and useful programming and resources. Norie also brings an expertise in building diverse and collaborative partnerships and an ability to engage audiences in understanding important ecological concepts. Olivia is the Riparian Analyst at The Freshwater Trust in Portland and has experience collaborating with multi-agency and multi-disciplinary groups to design and implement large-scale restoration and conservation programs. She is interested in two-way collaboration in developing invasive species management, communication, education, and policy strategies that are effective and actionable. Her qualifications include specialization in plant ecology and noxious weed surveys, leadership of multi-state restoration programs, and improving the long-term function of natural systems. As the Oregon/Washington Invasive Species Program Coordinator at the Bureau of Land Management (BLM), Erin provides recommendations for invasive plant management to all BLM offices in Oregon & Washington. She has over 20 years of experience working as a Weed Manager for Oregon BLM, 19 of which were spent working in rural eastern Oregon. She has experience managing BLM District Weed Programs and control activities including chemical, biological, manual, and mechanical methods. She looks forward to strengthening relationships between the BLM and OISC. Dr. Christine Moffitt has extensive experience in aquatic resources. After retiring from a long career as an educator and researcher at the University of Idaho and with the USGS, she moved to the South Oregon Coast. Christine is actively engaged in Oregon Coastal issues and presently serves on several boards and councils including the Oregon Sea Grant Advisory Council, the Western Regional Panel on Aquatic Nuisance Species, and the Friends of South Slough NEER. She is a Fellow of the American Fisheries Society (AFS) and remains very active at all levels with AFS activities. Her expertise includes ballast disinfection systems, non-native aquatic pathogens, aquaculture risk management, quagga/zebra mussel and other non-native mollusk mitigation, and control measures. Meg has been a valuable member of the OISC for the last two years and is now beginning her second term on the Council. As a Pest Survey Specialist with USDA APHIS PPQ, Meg has extensive experience with invasive agricultural pest programs from California to Florida. She brings knowledge of rules and regulations for federally regulated species in addition to experience in invasive agricultural pest and pathogen monitoring. Visit our Council page for a full list of Ex Officio members and current Appointed Council members. The OISC has a new webpage, “Invasive Species Videos” which can be found under the “Resources” tab. The Invasive Species Videos webpage will be used as a place to share important invasive species videos from the Council and our partners. If you have any invasive species videos you’d like to share, or know of any YouTube channels that post invasive species videos, please email us a link so we can share it! 1st slide of Emerging Pest webinar outlining the agenda. 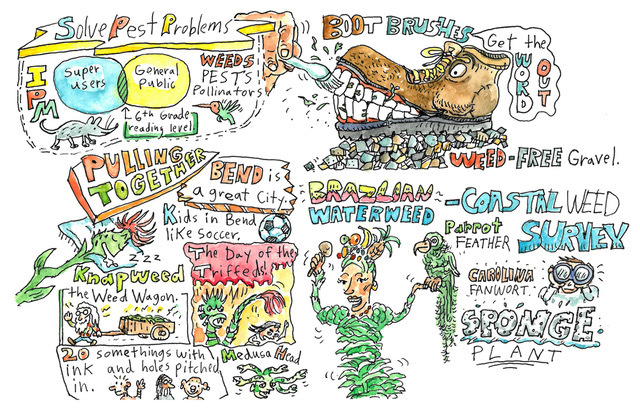 Opening slide for of Emerging Pests webinar. Check out the the new page “Invasive Species Videos ” to watch a full recording of the webinar, along with a handy Q&A sheet with questions (and answers) that were discussed during the webinar. Let’s stop these pests in their tracks! 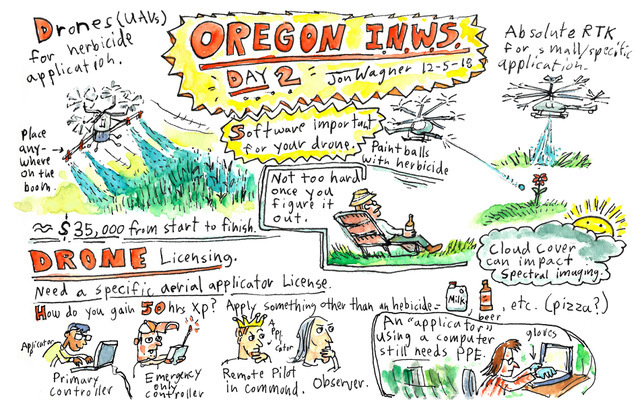 Jon Wagner (East Multnomah Soil & Water Conservation District) was recently presented with a “Special Recognition Award” during the Oregon Interagency Noxious Weed Symposium for his use of comics to further the cause of noxious weed control! Check out some of his amazing comics below that summarize key parts of the symposium. The Confederated Tribes of Grand Ronde includes people from the Oregon coast to the Cascades, and Portland to the Klamath Basin. The Confederation, which represents 27 tribes and bands speaking at least six different languages, is partnering with Metro to share ecological knowledge and practices in order to keep weeds at bay. Greg Archuleta, a Member of the Confederation, says that while some individuals think it is best to take a hands-off approach and “let nature fix itself”, he says of the confederation, “we’re more hands on”. Archuleta observes forests, prairies, wetlands and more throughout the greater Portland area, taking note of plants that can be used for food, medicine, or art. Aside from his work in the field, Archuleta also recently gave a presentation about native plants and food at the November 2018 OISC Meeting (see recap here). Camas bulbs, to be prepared for a meal (Photo by Greg Archuleta, 2018). Camas growing in Oregon (Photo by Greg Archuleta, 2018). Archuleta’s work often comes into contact with the issue of invasive species. There is a paradox regarding native species that can’t compete with invasives. 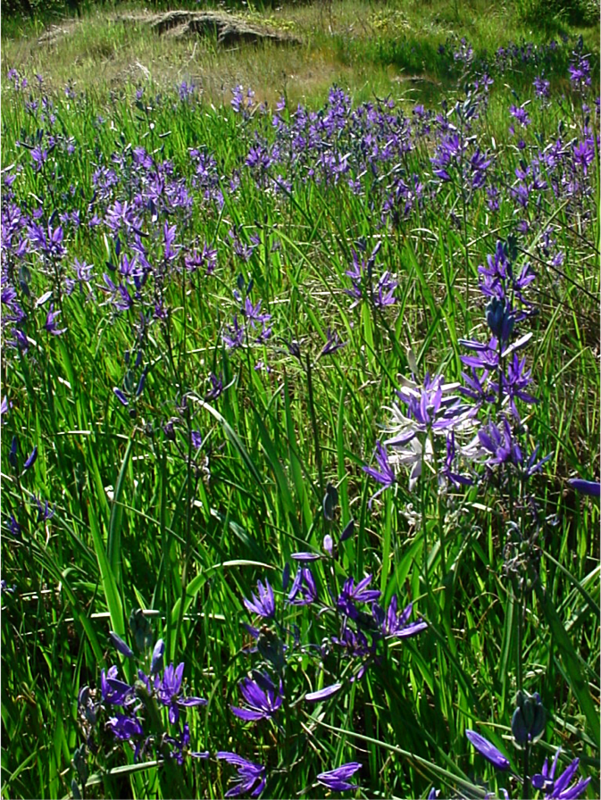 Research has found that native camas bulbs store some compounds from pesticides, and tribal members don’t feel comfortable eating the bulbs, even if levels of pesticide are considered “safe” by the EPA safety guidelines. However, the purpose of pesticide use is to control invasive weeds like reed canary grass and meadow foxtail that outcompete camas fields. Archuleta strives to resolve the issue by looking at the long-term goal: while he might not be able to gather and eat the bulbs, future generations will. Read the original article written by Cory Eldridge for Metro News.